Zhejiang Loong Airlines, based in Hangzhou, Eastern China, began passenger operations yesterday with two Airbus A320s. According to the airline’s weibo account, China’s Twitter-like microblogging service, the carrier’s maiden commercial services were flight GJ8691 and GJ8687, which flew from Hangzhou to Chongqing and Hangzhou to Shenzhen respectively. In addition to those two cities, the airline also flies from Hangzhou to Guangzhou, Wuhan, Chengdu and Xian with the aircraft. “It will expand its route networks to other Chinese cities to satisfy the market demands in the near future,” said Robin Tao, press and information director of Airbus China. The airline also signed its first purchase agreement with Airbus for 20 A320 family aircraft yesterday. The order includes 11 A320ceo and nine A320, and follows a Memorandum of Understanding signed in September at the Beijing Airshow. “We are making efforts to play a more important role in building the four-hour transportation circle around Hangzhou, which is advocated by the Zhejiang Government. 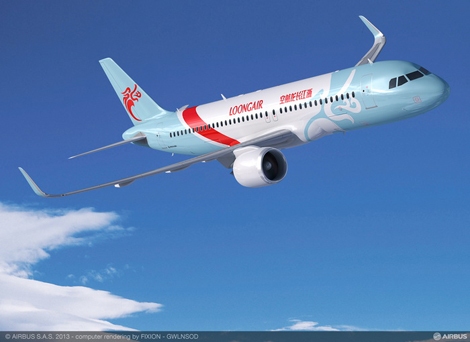 The Airbus A320 Family aircraft is ideal for us to achieve our goals with advantages in operational reliability, economics, cabin space and its commonality between different types of Airbus aircraft,” said Liu Qihong, chairman of Zhejiang Loong Airlines.